Behind the French Menu: Fleur de Sel - The flower of salt. The Special Crystals of Sea Salt Used in French Cuisine. The crystals of Fleur de Sel. Fleur de Sel - The flower of salt. is taken from the top of the drying pans of French Sea Salt. Crystals of dried sea salt, hand-harvested for its unique qualities. 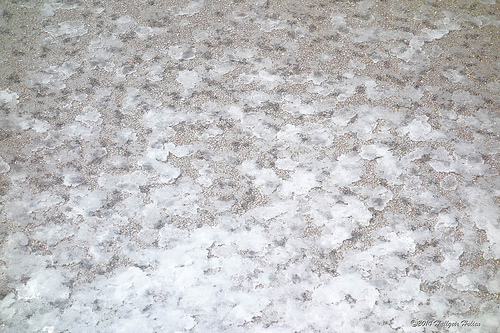 These are thin salt crystals, that together with other minerals have risen to the top of the salt pans that hold the rest of the drying sea salt. In the kitchen Fleur de Sel’s unique attributes are its texture as well as taste; when Fleur de Sel is used, as it should be, it will be added at the last moment before a dish is served and eaten just before it melts. If it melts in a dish, all that is left is a taste of salt; however, when the thin crystals of Fleur de Sel touch your tongue their thin and format and taste affects your taste buds differently to ordinary salt. Most Fleur de Sel will be slightly gray, but the best contains flashes of violet and other colors. The Fleur de Sel will have dried on top of the salt pans and the salt harvesters identify the crystals by eye; it is the flashes of color in these crystals that indicate the added minerals. 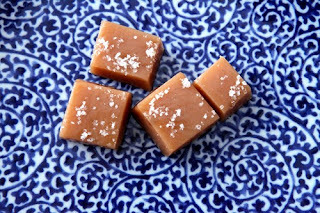 When properly served Fleur de Sel crystals will pop in your mouth; they add a new taste and a new texture to the dish with which this salt is served. 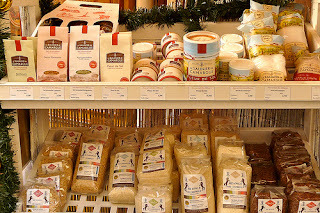 Fleur de sel on sale. The most well-known of France's Fleur de Sel producers are along France's Atlantic coast. The top three are Guérande, the Island of Noirmoutier, and the Island of Ile de Ré. Of these Guérande in the department of the Loire-Atlantique, just over the border from Brittany is the most famous. 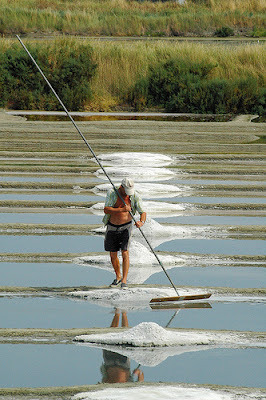 On the Mediterranean, the most well known is the salt field of the Camargue. All these may be visited. 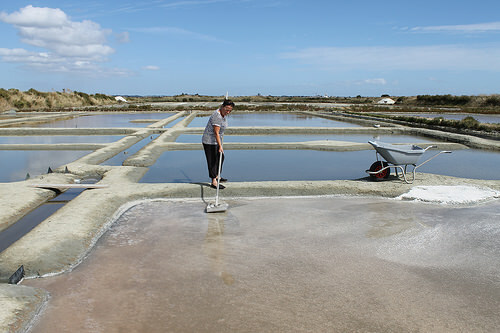 Visiting the salt fields of Guérande. (Next to the Parc Naturel régional de Brière). The salt fields of Guérande may be visited by car, but they also have an interesting option that allows a real understanding of their use of the sea marshes and rest of the salt industry by taking a barge tour. Both tours may stop at their Maison du Sel, their House of Salt Museum for more information on this unique industry. When you have seen and heard all you wish to know it is a five-minute drive, 6 km (4 miles) to relax on the beach in the nearby coastal resort of La Baule. La Baule is also very well known for its many seafood and fish restaurants. Guérande is 79 km ( 49 miles) from Nantes and 21 km (13 miles) from Saint-Nazaire. You may also enjoy the beautiful National Park of Briere that is next to Guérande. It has a French language website, but that is easily understood using the Google or Bing translate apps. Fleur de Sel sprinkled on caramels. Carpaccio de Saumon à la Fleur de Sel - Carpaccio of salmon served with Fleur de Sel. Chèvre Frais à l'Huile d'Olive et Fleur de Sel – Fresh goats' cheese served with olive oil and fleur de sel. The Fleur de Fel will be served separately to the cheese and olive oil. With a piece of bread dip a small piece of goat’s cheese in the olive oil and then in the fleur de sel before popping it into your mouth. The taste and texture of the cheese and the olive oil is tasted and then accented by the texture of the salt melting in little pieces on your tongue. The combination creates a fresh appreciation for both the cheese and oil. Wonderful! Chipirons à la Plancha Fleur De Sel - Small calamari, squid, cooked on the plancha and served sprinkled with Fleur de Sel. Contre-filet Simplement Tranché a La Mignonnette De Poivre et Fleur de Sel – A USA strip steak, a UK Sirloin, simply sliced and served on pepper mignonette with Fleur de Sel. 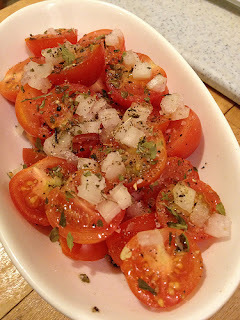 (Pepper mignonette is grossly ground or crushed pepper). Le Pavé de Rumsteck Grillé a la Fleur de Sel Frites Maison et Salade. - A large cut of rump steak grilled with Fleur del Sel and served with the chef’s special French fries and a salad. Here the salt will not have been rubbed into the steak, rather added to steak and fries just as they are ready to be served. Os A Moelle et Ses Toasts, Fleur De Sel De Guérande - Bone marrow on toast served with Fleur de sel. This is a true delicacy and if it is on the menu do not pass it by. Pavé de Bar Rôti à la Fleur de Sel de Guérande – A thick cut of European sea bass, the fish, roasted over the Fleur de Sel from Guérande on the Atlantic coast. 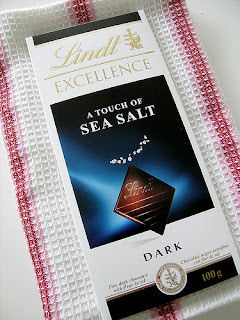 The Fleur de Sel should be added just before serving. Photograph courtesy of elPadawan and CC BY-SA. Fleur de Sel may be on your menu in many forms; for example fish or meat may be baked completely surrounded by a thick coating of Fleur de Sel. After cooking this salt crust is cracked open, and the dish served. The taste will not be salty, and the restaurant theater here is impressive. The menu may also offer a simple hors d’œuvre of fresh uncooked vegetables to be dipped in Fleur de Sel and then eaten as they are. Here the salt crystals popping inside your mouth affect the taste and texture of the vegetables in a manner that cannot be repeated with regular sea salt. Cherry tomato salad finished with a sprinkle of Fleur de Sel. Fleur de Sel On the Mediterranean coast. Visit the lovely town of Aigues-Mortes at the edge of the Camargue on the Mediterranean and from there visit its salt industry. Wherever you are on France’s mainland coastline, you will not be far from salt farms and sources of Fleur de Sel. Salt is, in any case, essential to our well-being, so enjoy. A Contre-filet, or Faux- filet - A UK Sirloin, a USA Strip Steak. Bar or Loupe, the European Sea Bass. Bar or Loupe on French Menus.